Smart parcel system was launched March 1st 2018 in Tampere. The new service allows online buyers to have parcels from web stores from everywhere in the world to be shipped to a designated automatic parcel terminal at a K-Group store. The first automatic parcel terminals will be available for use from 1st of March 2018 at K-Citymarket at Linnainmaa and K-Supermarket at Kaukajärvi in Tampere. The large-capacity automatic parcel terminals are available for shared use by all parcel service providers. The international express carrier DHL Express is one of the companies that delivers parcels directly to the new automatic parcel terminals. “The K-Group actively develops services that help the daily lives of its customers. K-Food stores already offer the most comprehensive parcel and postal services in the grocery trade in Finland through the approximately 850 K-Food stores throughout Finland. We are now, together with our significant Finnish business partners and Smartmile, introducing the first pilot of a new service in Finland. The goal is to offers customers an easy and responsible method to retrieve their various web store orders from a single location”, says Petri Toivonen, K-Group Service Director. “We are really glad to start cooperation with a major retailer, K-Group. Our goal is to work together to create the best possible parcel retrieval experience for online customers”, says Aku Happo, CEO of Smartmile. 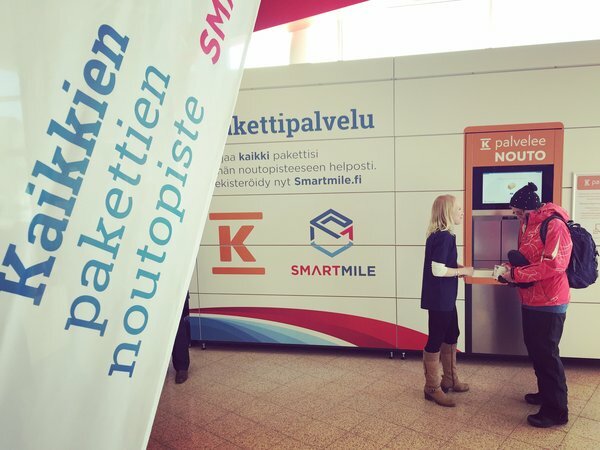 “If the pilot is successful, the service will be expanded also to other K-Group stores”, say Petri Toivonen from K-Group and Aku Happo from Smartmile. The City of Tampere Smart Tampere programme is one of the originators of the cooperation. The distribution model available to all parcel shipping service providers reduces distribution traffic, congestion and CO2-emissions and is therefore perfect for the city’s sustainable development principles. “The goal of Tampere is to be an example city in technological development and to serve as a platform for business development. We want to offer solutions, such as the service now being piloted, which improve the quality of life of city residents and improve the competitiveness of our region. Digitalisation can make daily life easier, increase well-being and safety, in addition to creating new business activity”, says Lauri Lyly, Mayor of City of Tampere. The customer benefits from being able to retrieve all online purchases from the same location include the ability to determine the pick-up time within the store hours and take care of all daily purchases while there. The automatic parcel terminals are being manufactured by the Finnish Konecranes. They utilise a new type of robotics technology, which brings the parcels to the pick-up point. In addition to parcel width and depth, the unit also measures height, which allows it to store up to 300 shipments at a time. The customer satisfaction at K-food stores is the responsibility of K-food retailers, which work together with Kesko’s grocery trade operating under a chain business model. The K-food store chains include K-Citymarket, K-Supermarket, K-Market and Neste K. K-food stores are globally the most responsible in their industry. Other strengths include superior produce sections, professional service, the widest product selections, Finnish products and private label Pirkka. K-food stores are both high-quality and affordable. K – to make shopping pleasant. Smartmile is an international venture, providing a cloud based software platform that connects automated parcel terminals to any online buyer, courier and retailer. Through this, Smartmile creates an open and shared urban delivery infrastructure that makes deliveries in cities more efficient and more convenient, while reducing traffic and CO2-emissions. Smart Tampere is a strategic development programme implemented by the City of Tampere for 2017-2021. It is intended to guide Tampere to becoming an internationally recognised intelligent city through cooperation of public operators, educational institutions, organisations and municipality residents. The programme creates innovation and testing platforms in Tampere that can be used by companies to develop their products and services and promote the creation and operation of ecosystems between various operators. Konecranes is one of the world’s leading lifting equipment manufacturers and its customers include machinery manufacturing and process industries, harbours, ports and terminals.The company supplies its customers with lifting solutions and maintenance services that improve operational efficiency. DHL Express transports time-sensitive documents and parcels reliably and quickly from door-to-door and is the global market leader in its industry. Daily flights between its European sorting centre in Leipzig and Helsinki connect Finland to the global DHL Express network, which extends to over 220 countries.